It was so sad that Yeon-Seo could not save the little girl, despite trying her best. I felt sorry for the girl who should be able to survive, if not for all the delays to her treatment. Yeon-Seo was very affected by her first failed surgery and she tried to be strong and continue her work. Doctor Promade on the other hand was so unprofessional and irritating because he is only concern about himself and not as a doctor. 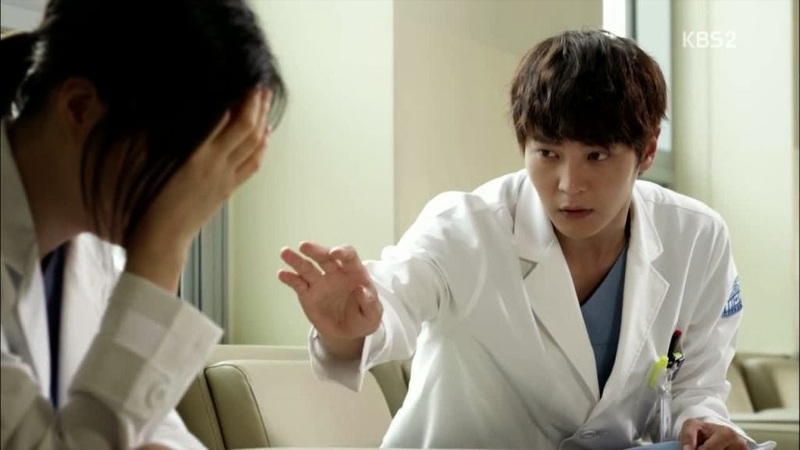 Jin-Wook is really a nice chap and i like how he treated Shi-on so well and the resident spy Il-Kyu is a pain in the neck. I don't like how he pick on Shi-on and make himself superior to him. I think Jin-Wook, Yeon-Seo, In Hye and the Nurse Jo treated Shi-on very well and that is very kind of them. I like the drawing of Shi-on and it was amazing that he told Yeon-Seo that the memories will be in the heart. It was heartwarming to see him drew a bunny and his hyung walking towards heaven. The hug that Yeon-Seo gave Shi-on is very touching. It is like Yeon-Seo found comfort and strength through Shi-on. Nonetheless, the drama will talk about the interpersonal link of Shi-on with animals in this werewolf girl case. We see Shi-on as the one to extend helping hands to those in need.